More than 18,000 participants have enrolled in Eat Smart, Move More, Weigh Less since July 2009. 91% of participants are either satisfied or very satisfied with the real-time online delivery of Eat Smart, Move More, Weigh Less, and 96% indicate they would recommend the real-time online classes to others. Click here for a PDF of all published articles. 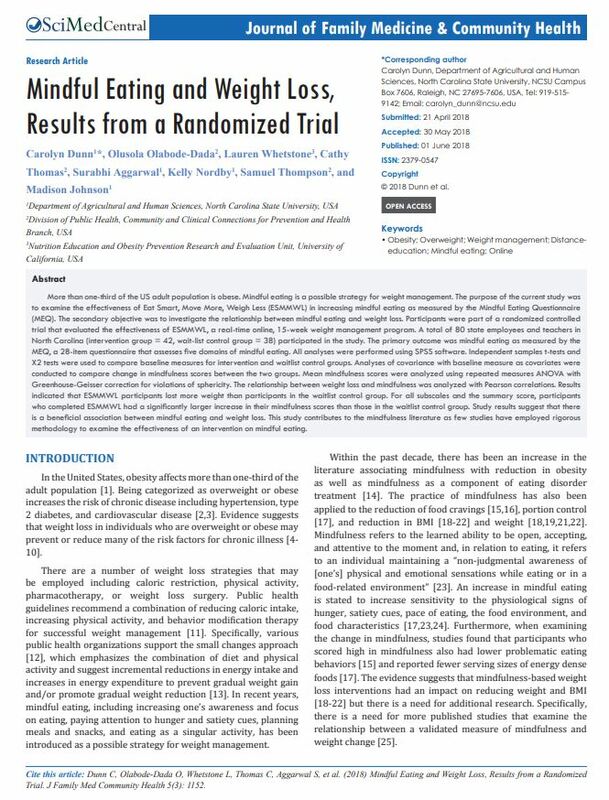 Dunn C, Olabode-Dada O, Whetstone L, Thomas C, Aggarwal S, Nordby K, Thompson S, Johnson M. Mindful eating and weight loss, results from a randomized trial. J Fam Med Community Health. 2018; 5(3): 1152. Main Findings: Participants who completed Eat Smart, Move More, Weigh Less had a significantly larger increase in their mindfulness scores than those in the waitlist control group. Study results suggest that there is a beneficial association between mindful eating and weight loss. 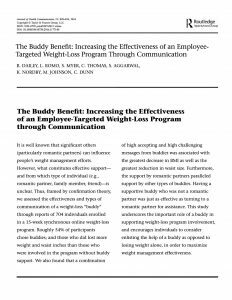 Dailey R, Romo L, Myer S, Thomas C, Aggarwal S, Nordby K, Johnson M, Dunn C. The Buddy Benefit: Increasing the Effectiveness of an Employee-Targeted Weight-Loss Program. J Health Commun. 2018. Main Findings: Individuals enrolled in Eat Smart, Move More, Weigh Less should consider enlisting the help of a buddy, opposed to losing weight alone, in order to maximize weight management effectiveness. 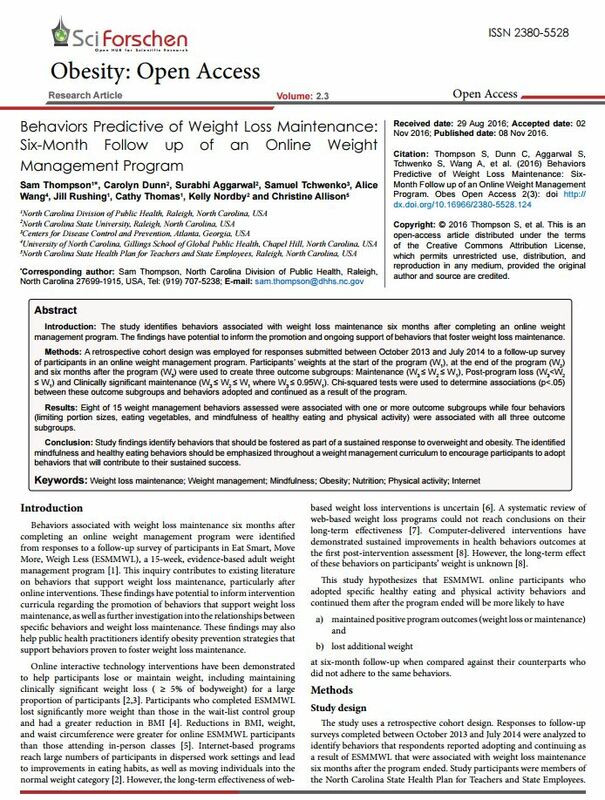 Thompson S, Dunn C, Aggarwal S, Tchwenko S, Wang A, Rushing J, Thomas C, Nordby K, Allison C. Behaviors predictive of weight loss maintenance: Six-month follow up of an online weight management program. Obes Open Access. 2016;2(3). Main Findings: The program implements evidence-based behaviors associated with weight loss maintenance, including limiting portion sizes, eating vegetables, and mindfulness of healthy eating and physical activity. Dunn C, Olabode-Dada O, Whetstone L, Thomas C, Aggarwal S, Nordby K, Thompson S, Johnson M, Allison C. Using synchronous distance education to deliver a weight loss intervention: a randomized trial. Obesity. 2016; 24(1):44-50. 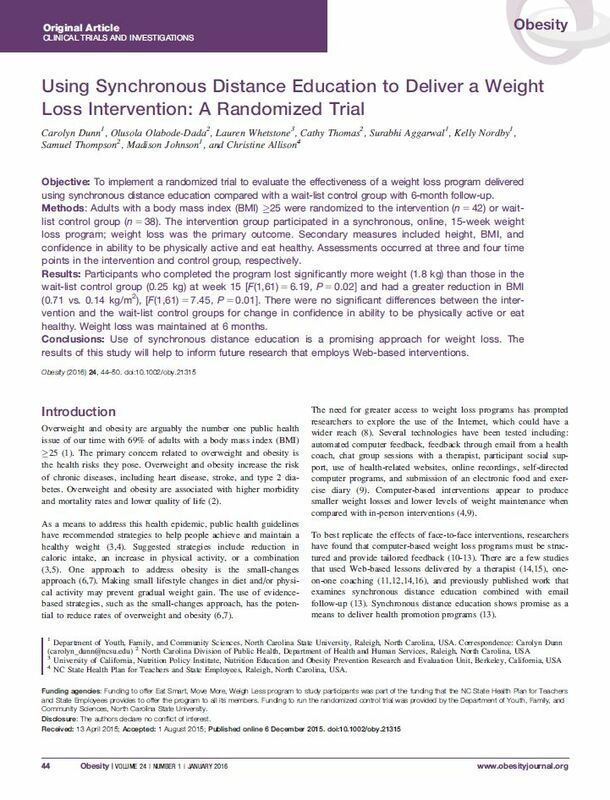 Main Findings: Participants who completed the program lost significantly more weight than those in the wait-list control group and had a greater reduction in BMI. Weight loss was maintained at 6 months. 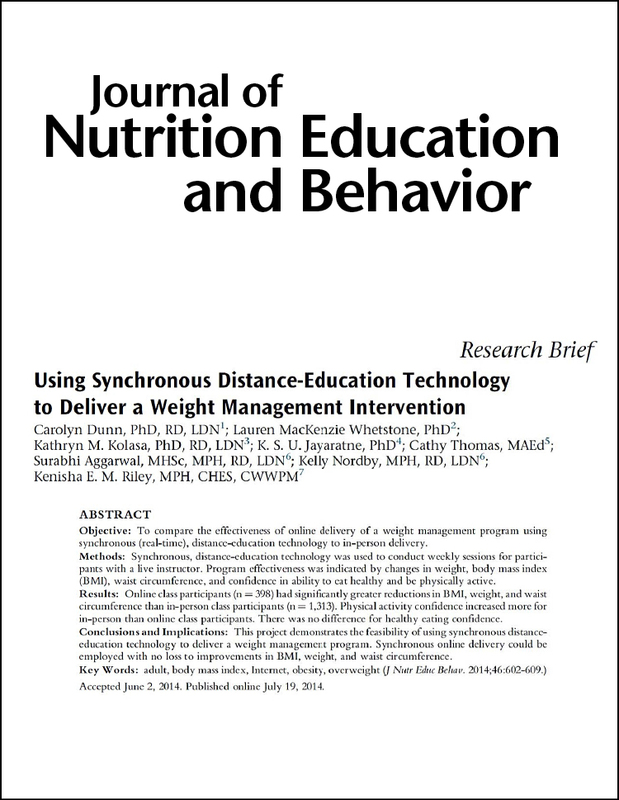 Dunn C, Whetstone L, Kolasa KM, Jayaratne KSU, Thomas C, Aggarwal S, Nordby K, Riley K. Using synchronous distance education technology to deliver a weight management intervention. JNEB. 2014;46(6):602-609. Main Findings: The program is delivered in real-time, online distance education format supported with personalized emails expands the reach of nonclinical weight management. The online delivery produces similar impacts when compared to in-person delivery and achieves positive outcomes related to weight, healthy eating, physical activity behaviors and has the potential to reduce health care costs. Dunn C, Whetstone L, Kolasa KM, Jayaratne KSU, Thomas C, Aggarwal S, Herget C, Rogers AB. 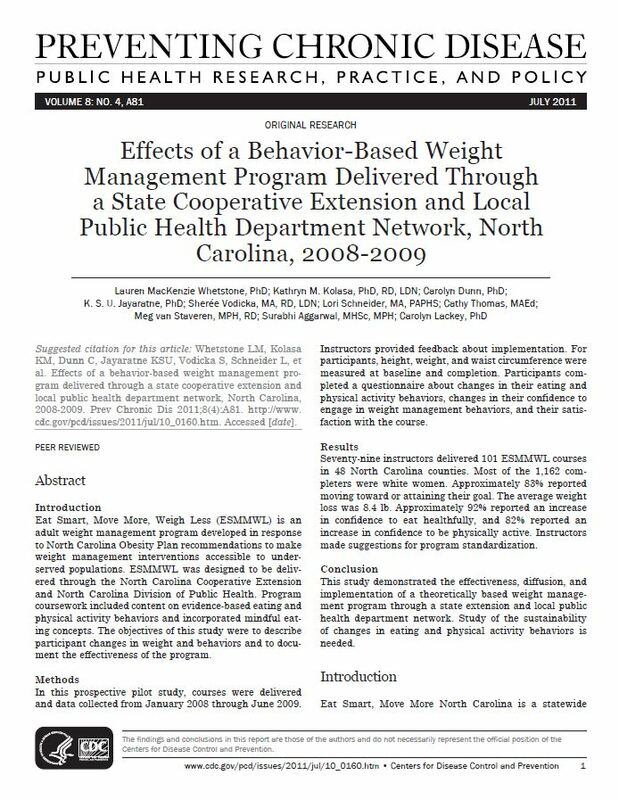 Delivering a behavior-change weight management program to teachers and state employees in North Carolina. Am J Health Prom. 2013;27(6):378-383. 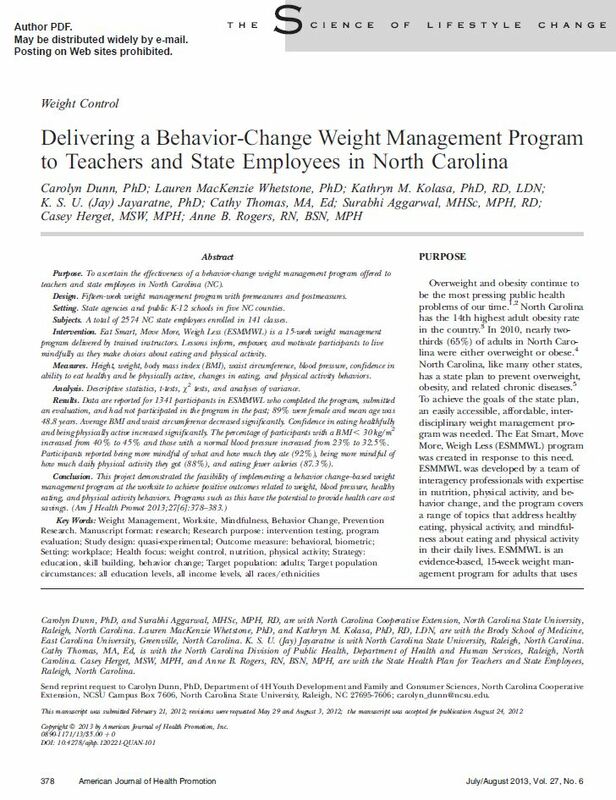 Main Findings: The program demonstrates the feasibility of implementing a behavior change-based weight management program at the worksite to achieve positive outcomes related to weight, blood pressure, healthy eating and physical activity behaviors and has the potential to reduce health care costs. Whetstone L, Kolasa K, Dunn C, Jayaratne J, Vodicka S, Schneider L, Thomas C, vanStaveren M, Aggarwal S, Lackey C. Effects of a behavior-based weight management program delivered through a state cooperative extension and local public health department network, North Carolina, 2008-2009. Preventing Chronic Disease. 2001;8(4):A81:http://www.cdc.gov/pcd/issues/2011/jul/10_0160.htm. Main Findings: Eat Smart, Move More, Weigh Less is an effective weight management program that is associated with decreased weight and increased confidence in healthy eating and physical activity. 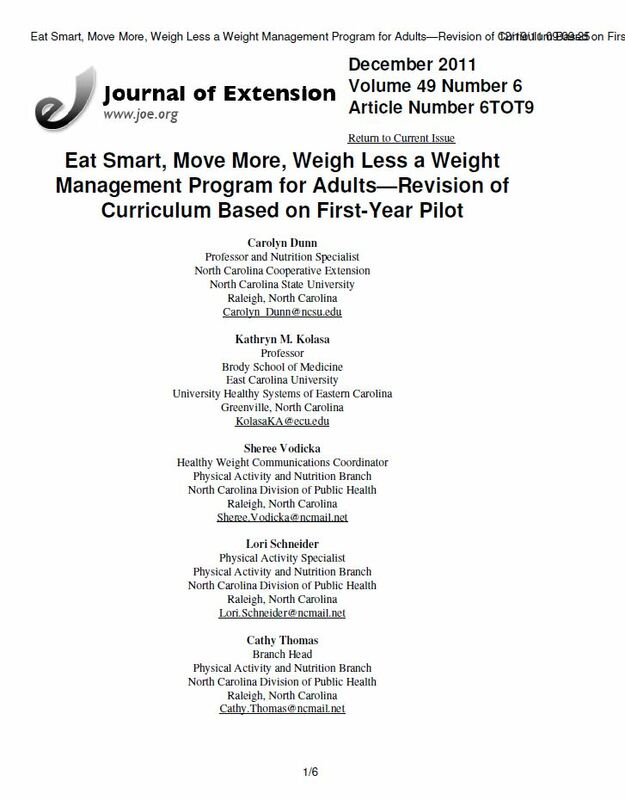 Dunn C, Kolasa K, Vodicka S, Schneider L, Thomas C, Smith C, Lackey C. Eat Smart, Move More, Weigh Less a weight management program for adults – revision of curriculum based on first-year pilot. J of Extension. 2011;49(6):6TOT9. Main Findings: The program uses the Theory of Planned Behavior and strategies identified in the professional literature that are associated with healthy eating, physical activity, and achieving and maintaining a healthy weight. 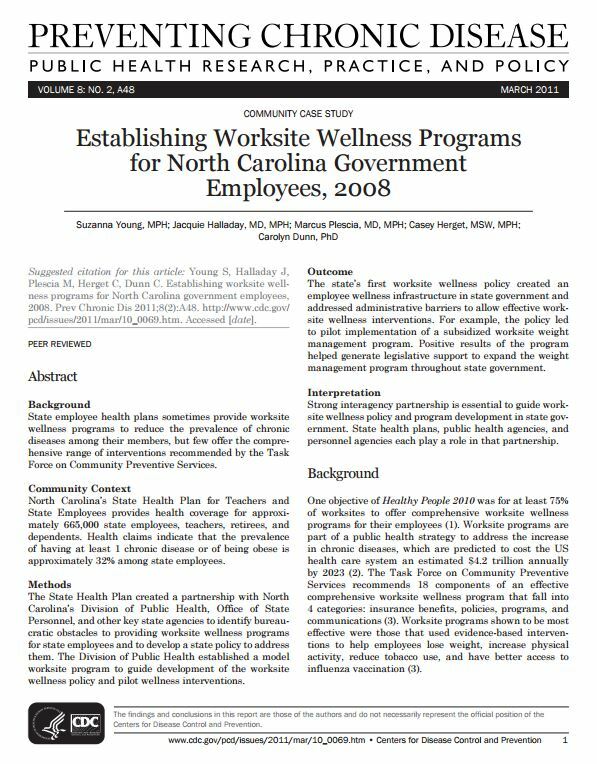 Young S, Halladay J, Plescia M, Herget C, Dunn C. Establishing worksite wellness programs for North Carolina government employees, 2008. Preventing Chronic Disease. 2001;8(2):A48:http://www.cdc.gov/pcd/issues/2011/mar/10_0069.htm. Main Findings: Partnerships are essential to guide worksite wellness programs. State health plans and public health agencies each play a role. 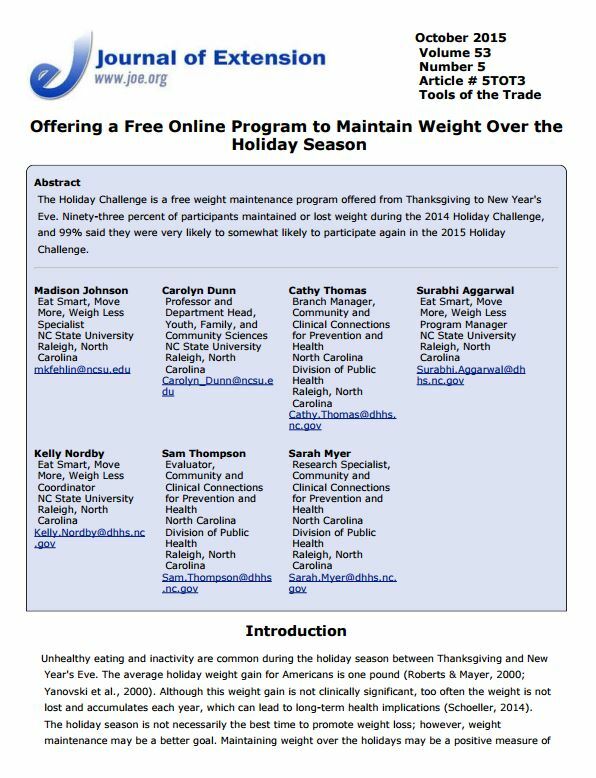 Johnson M, Dunn C, Thomas C, Aggarwal S, Nordby K, Thompson S, Myer S. Offering a Free Online Program to Maintain Weight Over the Holiday Season. J of Extension. 2015;53(5):5TOT3. Main Findings: The Holiday Challenge is an effective way to help adults maintain their weight over the holiday season. The online platform allows participation across the United States. Dunn C, Haubenreiser M, Johnson M, Nordby K, Aggarwal S, Myer S, Thomas C. Mindfulness Approaches and Weight Loss, Weight Maintenance, and Weight Regain, 2018. Current Obesity Reports. 2018:https://doi.org/10.1007/s13679-018-0299-6. 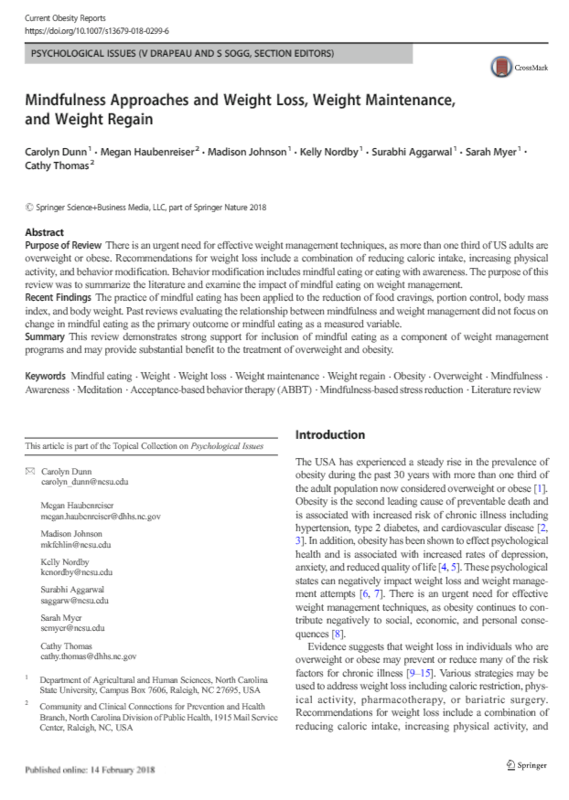 Main Findings: This review demonstrates strong support for inclusion of mindful eating as a component of weight management programs and may provide substantial benefit to the treatment of overweight and obesity. State health plans and public health agencies each play a role.